Full Extent Button. Zooms to the full extent of the map. Zoom In Button. Zooms in on the map. Zoom Out Button. Zooms out on the map. Zoom In Tool. Draw a rectangle on the map and zoom to the extent of the rectangle. Pan Tool. Click and drag the map to change the viewable area. Identify Tool. Click on the map and retrieve information for that point location. A small resizable and movable window will display information on the clicked location. Previous Button. Changes the extent of the map to the previous extent displayed before the last pan or zoom operation. Next Button. Changes the extent of the map to the next extent in the list. This button is only enabled when the Previous Button is used. This allows you to move back and forth between the extents you have chosen. Spatial reference is EPSG:4326 (latitude/longitude based on the WGS84 datum). This spatial reference supports adding additional layers from non commercial map servers. This is the most widely supported spatial reference system for non commercial providers. Requires a login in order to access the map. The login allows the system to save and retrieve your custom map. The login is not used for security or commercial purposes. The only information required is a username, password, and email. Standard map navigation using the mouse wheel to zoom in and out, and click-drag to pan the map. A map scale displayed in both miles and kilometers in the lower left corner of the map. The map coordinates of the current mouse position are displayed in the lower right corner of the map in latitude and longitude units. Layers list and legend can be resized and collapsed to increase the map area. The Layers / Legend window is located to the left of the map display area. This window has a tab interface that allows you to switch between the layers view and legend view. The layers list allows you to select which layers will be displayed in the map. The dynamically generated legend will display layer symbols for layers that are currently displayed in the map. The legend symbols are downloaded from legend graphics published on WMS map servers according to OGC standards. Note that legend symbols are dependent on published graphics and are therefore not available for all layer types. 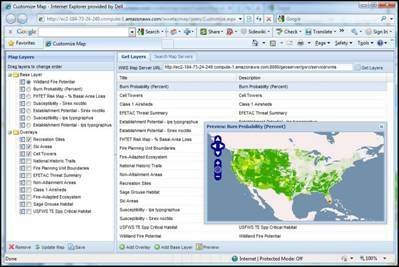 Access a separate web browser page with tools for customizing the map from a button above the map. Search for web map servers and layers by a user specified search term. Preview layers before adding them to the map. Add layers from any OGC compliant web map service. Remove layers from the map. Specify the default visibility of the layers. Update the map with changes. All changes made to the map can be saved for future sessions. 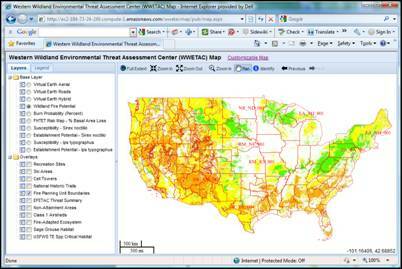 The existing map client was developed for the US Forest Service and is available for free on their website. Custom software development services are provided to further enhance or customize the existing map client to suit the needs of various users. In addition, we offer open source map server cloud hosting to serve your GIS data on the web.